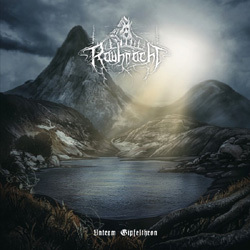 With a whisper of forgotten times, Austrian pagan black metal band Rauhnåcht (the personal project of Stefan Traunmüller) returns to the fray with its greatest work yet, “Unterm Gipfelthron”. It is the third full-length of the band and will be released on December 7th, 2018 worldwide via Debemur Morti Productions. Since forming in 2010, Rauhnåcht has released two titanic full lengths, “Vorweltschweigen” (2010) and “Urzeitgeist” (2014) in addition to a series of EPs and split releases. “Unterm Gipfelthron”, meaning “below the throne of the mountain peak”, moves to the next-level: a hymn to nature through the medium of melodic, progressive pagan black metal, heavily immersed in Alpine mountain folk music, simultaneously majestic and introspective, bombastic and remote. Strikingly talented guest musicians are integral to the whole, woodwind adornments – meditative or dervish-like – and a stunningly mellifluous choir sweep the listener into misty-eyed reflection or act as a clarion call to the wild hunt. “Unterm Gipfelthron” is a hidden jewel, plucked from the furthest reaches of windswept forest dreaming. Pushing the boundaries of the cold black metal sound heard on previous releases, the new album presents a new level of depth and evolution for the band. Furious black metal riffs, screams, and blast beats collide with victorious melodies, mystic folk instrumentation, eerie synths, and otherworldly chanting to evoke forgotten times and alpine landscapes. Elements of magical dark ambient and dungeon synth bisect these pagan battle hymns, moments of calm that both precede and follow the storms to come. Rauhnåcht give past traditions an otherworldly new context within its 5 new songs. “Unterm Gipfelthron” is available now for pre-order in vinyl and cd edition in the label’s e-shop. Rauhnåcht has already unveiled the wonderful album cover art and tracklist, as well as the opening track “Zwischen den Jahren” that you can listen to below.